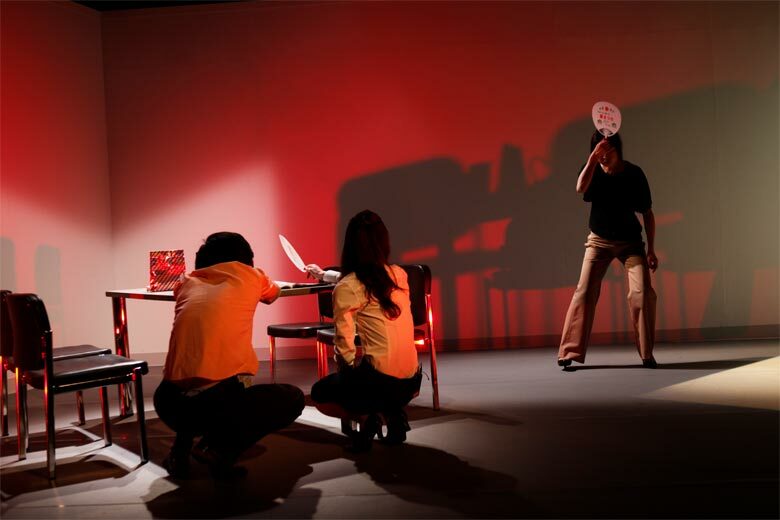 In a three-part performance full of bizarre gestures and circular wording, a Japanese theatre troupe examines office politics in an off-the-cuff way. Performed completely in Japanese, everything in Cheltfisch is translated via a series of projected subtitles, allowing the subtle social dynamics of Japan to really shine through. Three office temps sit around the table. Cue music — and it is revealed that these three office temps are in charge of organizing a coworker Erika’s farewell party. These three workers are organizing Erika’s farewell party. As they discuss organizing Erika’s farewell party in a roundabout fashion, they are offering very little information as they are speaking in circles. They are hardly saying anything at all despite spewing out many words, and while they speak, they are moving around the stage with exceptionally awkward gestures and positions. Their movements are completely erratic and unpredictable, quite unlike the words they are saying, which are constantly repeating the same themes in every short segment. Every few minutes is punctuated by awkward movements and repetitive text which says nothing but is humorous in its ability to say almost nothing despite their extended duration. Though the office workers spend an exorbitant amount of time talking about the same things ad nauseum, they entertain the audience with their body movements, which are much more erratic. Everything about their movements is stiff and intense, governed by no rhyme or reason, and all of the words they say harp on the same topic. Myriads of words are exchanged but little is said, just like in this paragraph. Everything about part one of Cheltfisch is about form and format and less about content. Movements follow a pattern of stilted spontaneity and words beat horses to pulpy, bruised death. Discussions about farewell parties, free monthly magazines called Hot Pepper, and motsu hot pot (“Motsunabe (もつ鍋?) is a type of nabemono in Japanese cuisine, which is made from beef or pork offal.”, according to Wikipedia, which the performance itself in fact cites), offer little information, but somehow, part one never seems to stop being interesting. Air Conditioner, on the other hand, rambles on for a bit too long — but it also happens to be the segment with the most humorous moments and the most challenging social dynamics. A seemingly shy female office worker is complaining to her male superior about the frigid temperature in the office building and how its 23’C temperature makes her so miserable she wants to quit her job. All the while, she is smiling politely, and undertones of male perversion take form in the male superior. Half-listening and nodding dumbly, he makes generalized statements about women’s bodies being more prone to poor circulation than those of males, and even kneels down and peers up the woman’s skirt on occasion. The movements in Air Conditioner seem to be set on loop, repeating like the words repeated in Hot Pepper — but again, they are less important than the segment’s general intent and form, which seems to comment on office politics and the tendencies of workers to deliver shallow pleasantries in the most unconfrontational ways possible. Smiling and nodding individuals face one another as though blindly reacting to one another, as negative complaints contrast directly with overly friendly body language. In the third and final part, every worker that has been thus far introduced is present — yet the segment is essentially pared down to a monologue from Erika, the worker who is leaving the company. As she celebrates her departure, she begins with a few repetitive lines about how she has been at the office for just under two years. One instantly begins to worry that part three will be another 20-minute segment with very little content, made even more daunting by its focus on one person rather than multiple. But here the format changes dramatically. Erika charges full speed ahead with tales: tales about missing elevators; tales about how her black shoes remind her of talking penguins; and so on. In her fictional farewell speech, Erika shows off her quirkiness as one of the only characters in the entire performance who seems to only minorly care about what other people think. Unfortunately, the entire last segment drags on for far too long, and ends on a low note, despite its apparent message. C’est la bizarre office politics vie.